•DANIEL Chisenga shows how his stomach looks after a successful operationin Italy. 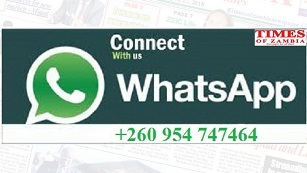 CASES of diagnosis of wrong ailments have continued to be prevalent in the Zambian society. Many patients have continued to complain that they are given wrong treatment and prescription for diseases which they have been wrongly diagnosed. However, it is only hoped that relevant authorities address the problem before many lives are lost resulting from some medical negligence. This is a situation a Ndola family found itself in when their son, Daniel Chisenga, who would have died by this time if he had continued to be given wrong treatment. 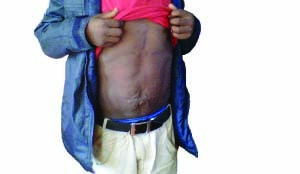 Chisenga, 18, of Chipulukusu Township in Ndola was living with a tumor in his stomach and was treated for a wrong ailment for 14 years. According to Daniel’s mother, Esnart, Daniel was born a healthy baby and she did not experience any abnormalities during pregnancy. At the age of two, he developed a condition. His stomach started bulging, it was full of water and this affected his growth. Six months letter, Daniel and his family relocated to Kapiri Mposh District where he was first taken to the district hospital. Arthur Davison Children’ Hospital (ADH). This is where Daniel was first attended to. Doctors at the hospital failed to detect anything specific and only found the presence of smoke-like stuff whose cause could be found. In 2005, the doctors decided to put him on a tuberculosis (TB) treatment. The results were not encouraging and the treatment was discontinued. In the early 2006, Zambia was flooded with medical doctors from the Democratic Republic of Congo DRC). Some of which were posted to ADH where Daniel was seeking treatment. The DRC doctors advised that the boy be taken for an echocardiolography and indicated from the onset that it was not something that could be treated in Zambia. But a Zambia medical doctor at ADH, Sam Phiri carried out an examination. He was the first medic doctor to detect that Daniel had a defective liver. This is how Daniel and her mother continued to live with the disease which could not be treated in Zambia. Until August 2010, the boy was just undergoing water extraction every month. His mother remained prayerful and continued to have faith in God that her son will one day be cured from the illness. She hoped that Government would come in and help her child. She was also mindful of the procedure leading to Government’s intervention. She wondered why those responsible at ADH had not transferred the case to the University Teaching Hospital in Lusaka (UTH) so that a group of medical doctors would have him operated or possibly recommend him for treatment abroad. For Daniel, life went on. Despite having the condition, he performed well at school and had a multitude of friends, who accepted him and his condition. It took an Italian doctor, Giovanni Bellagamba, who was on a private visit in Luanshya to diagnose the illness. He examined the boy and said that the boy was robbed of valuable nutrients from the body through the water extraction he was undergoing every month. In October, Dr Bellagamba introduced the boy to two drugs;Fresensemide and Carenon. These drugs improved Daniels condition and appetite. Further examination was conducted by the Italian doctor and it was later discovered that the boy had a problem with the heart and not the liver. Esther did not hide; the news was as disappointing as the initial diagnosis indicated that her son had a liver problem. She had hope and prayed that the Italian doctor would help her son. Dr Bellagamba was mandated to carry out an independent diagnosis; he also arrived at the liver and completely ruled out anything to do with the heart. The earlier diagnosis read” The overall diagnosis was rheumatic heart disease with mitla complicated with congestive cardiac failure (ascites). “He was treated symptomatically, furusemide,anti tuberculosis treatment he was regularly going for paracetasis to relive pressure in abdomen due to fluid accumulation,” Reads the medical report. Daniel with the help of Vulnerable Advocacy for Childrens Programmes (VAP), last year in January was taken to Italy for an operation. Daniel in an interview in Ndola said his operation in Italy was successful and that he is happy to be a normal person without any abnormal ailment on his body. He narrated that he was taken to an Italian Hospital which specialises in liver and heart problems. He was put on observation. After one month, he said his mitral valves in the heart were replaced. He got cured and the water in the stomach suddenly disappeared. He said he was under medical observation for four to five months at Casacidi Kim Home in Italy. In July last year, he returned home a normal person. He is now living a normal live. Daniel, however, appealed to all those with abnormal ailments such as tumors to have faith in God as having a tumor could be the end of one’s life. “I am a testimony that things can work, I lived with a tumor for more than 14 years, look at me now, I am a normal person and living a normal life. People should not give up, but learn to be patient and wait for God to manifest in their situation,” He said. Daniel is now in grade 10 at Chifubu High School in Ndola. He is been sponsored by VAP, a Non-Governmental Organisation(NGO) based in Ndola. It is lead by Dindasio John Daka who is also director for Ulalo Community in Chipulukusu Township in Ndola. Many people in Zambia have lost their lives due to wrong diagnosis by local doctors. Could this be as a result of negligence or lack of specialised medical personnel in the country? And the problem that Daniel had, could it be a similar problem that Joseph Sikombe,26, of Ndola has? , if it is, what are our medical doctors doing about his condition? Joseph has been living with the tumor for the past six years. He is now in Lusaka waiting for a test at the University Teaching Hospital (UTH) in Lusaka to be conducted this month.